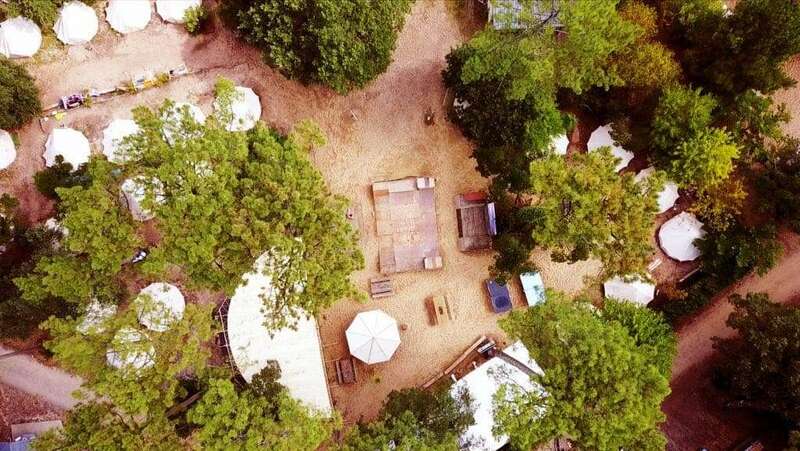 At our Moilets Surf Camp expect perfect waves for all surfing levels, white sandy beaches, fantastic big surfers Tipi tents in the pine forest, great atmosphere & amazing people. 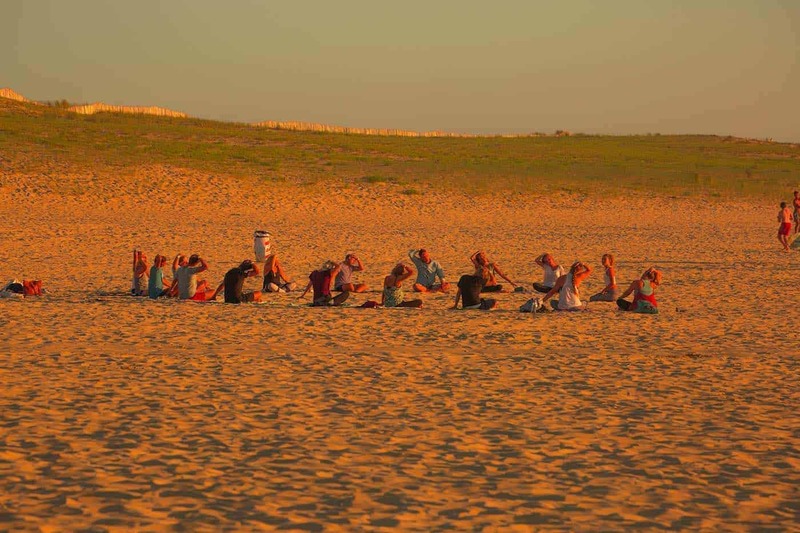 This is not only the best surf camp in France, but probably the best surf camp in the world. 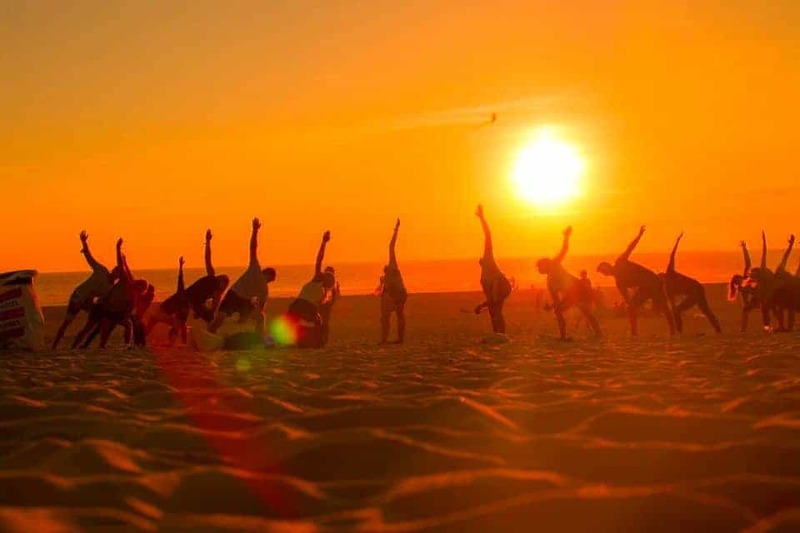 Combine surfing, yoga & a vibrant social scene & you have a dream surf holiday. 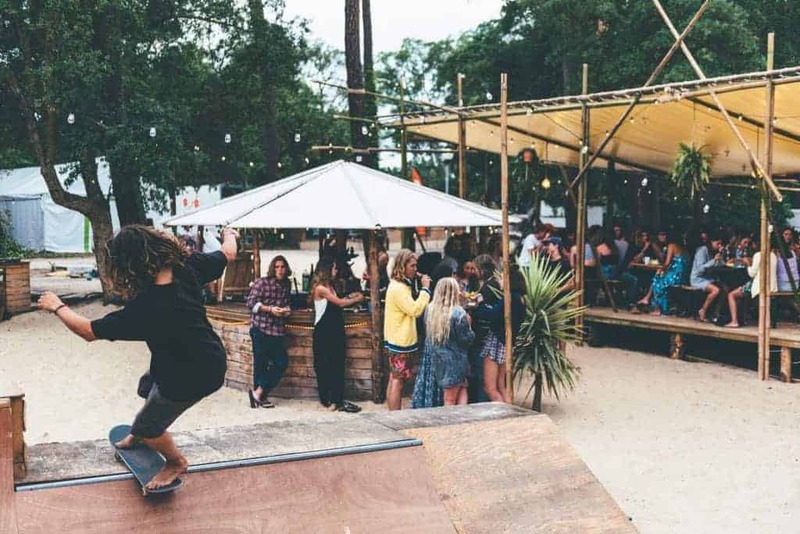 All about the Moilets Surf Camp, 8 Days, Surf Camp in France. You may have heard of it already, the original & famous Moliets Surf Camp. 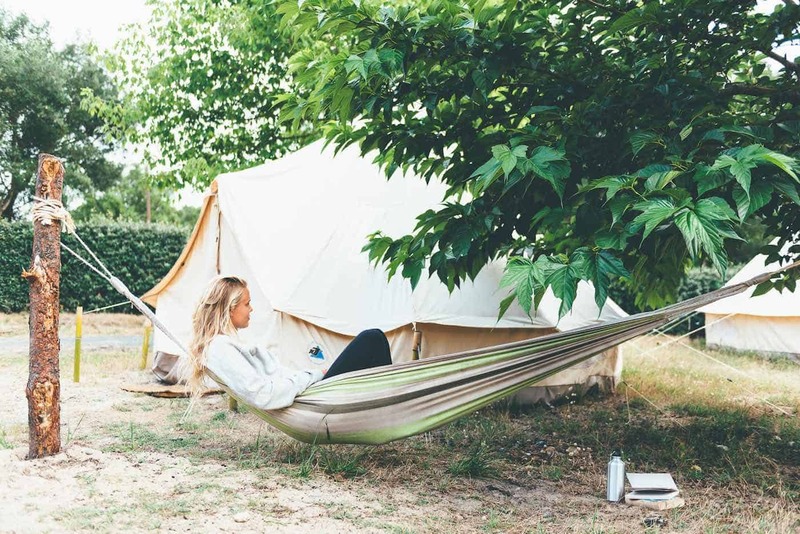 Set in the beautiful pine forests of Southwest France, just outside the vibrant town centre, your stylish Tipi style tent will be your surfer’s home away from home. 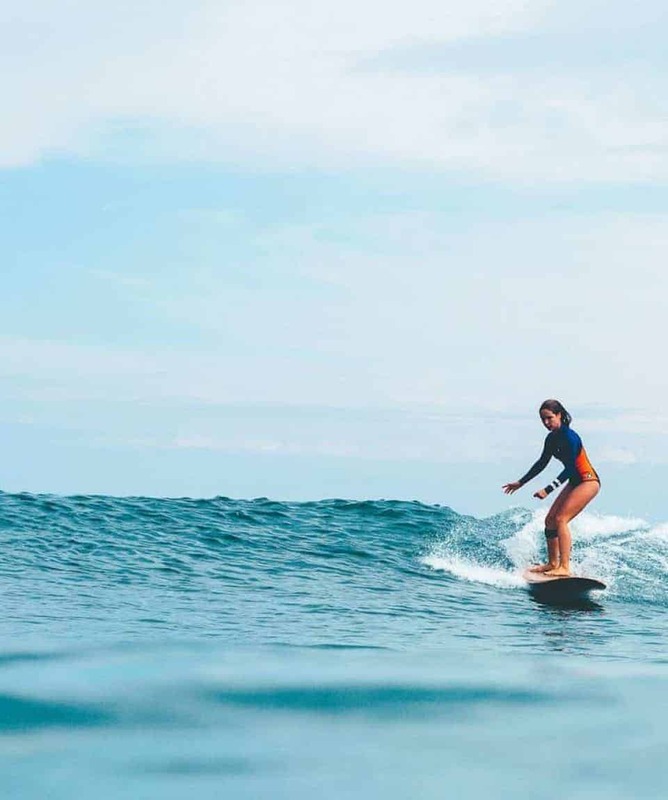 The waves here at Moilets-Plage are perfect for learning to surf, or if you’re an experienced surfer, a great place to improve & perfect your surfing style. And of course, our qualified local surf instructors will guide you every step of the way. 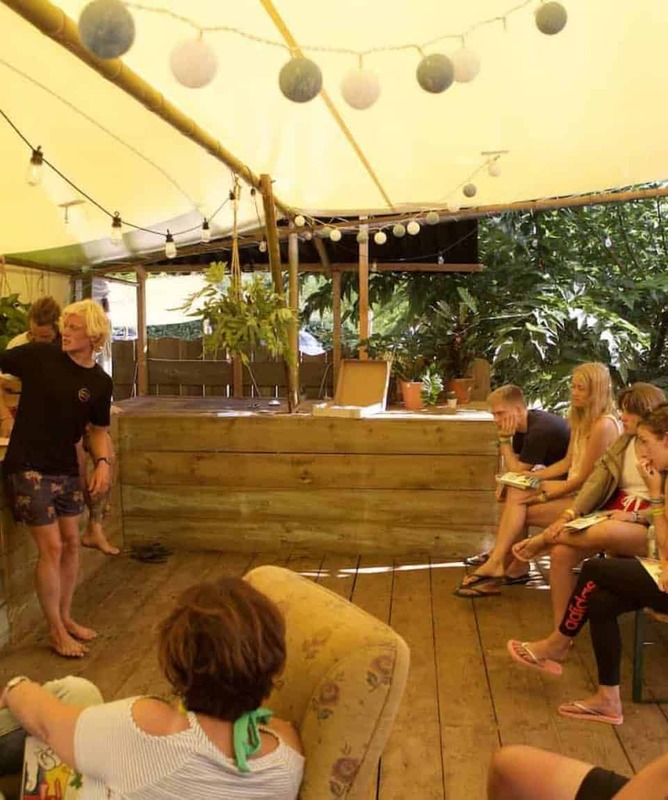 Out of the surf, you’ll enjoy hanging out on the hammocks & sun lounges in our chilled out communal areas. 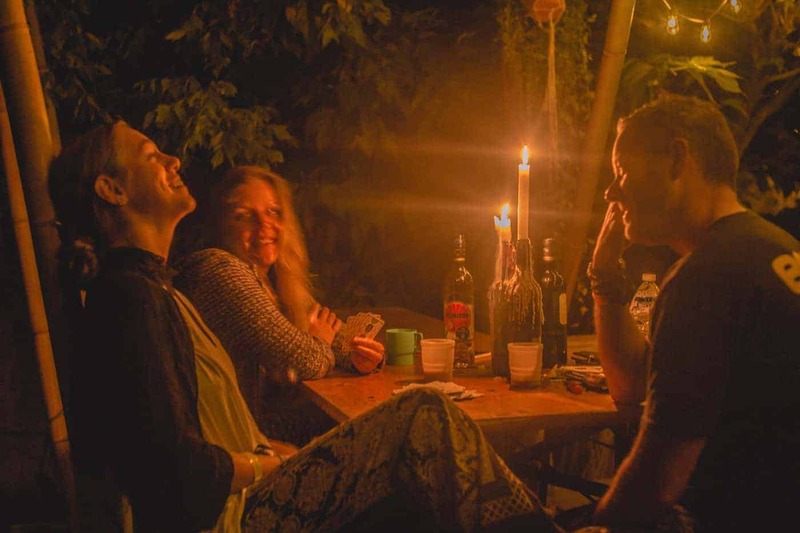 A great setting for hanging with friends or making new friends from around the world. 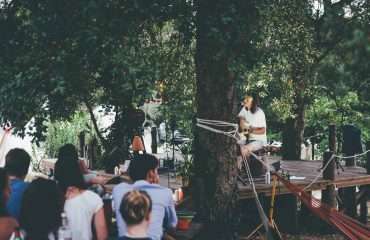 We also host some very cool events here like our famous tarp-surfing events & open-air cinema. 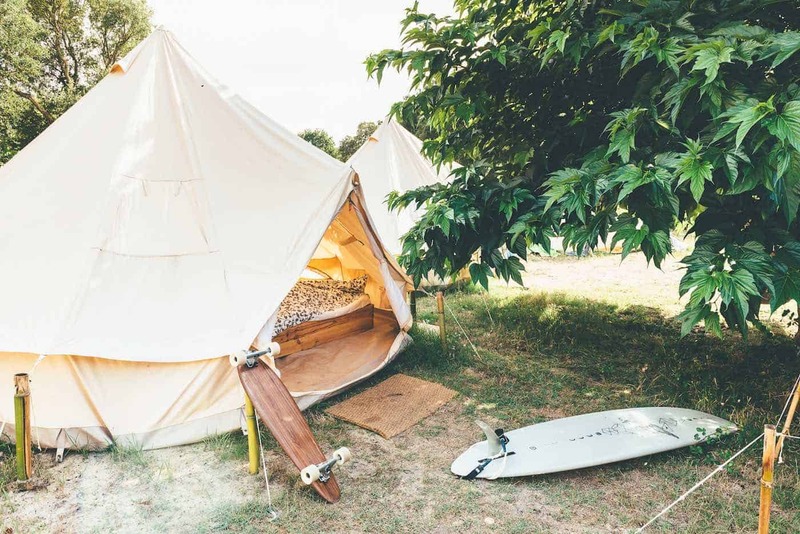 Together this all makes for an unforgettable surf camp experience. 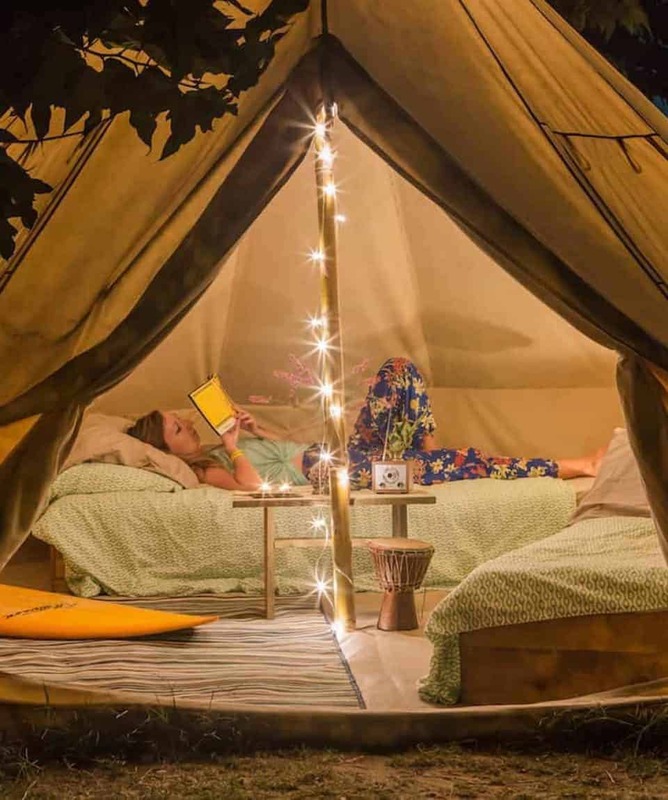 Super cool, stylish new bell tents. 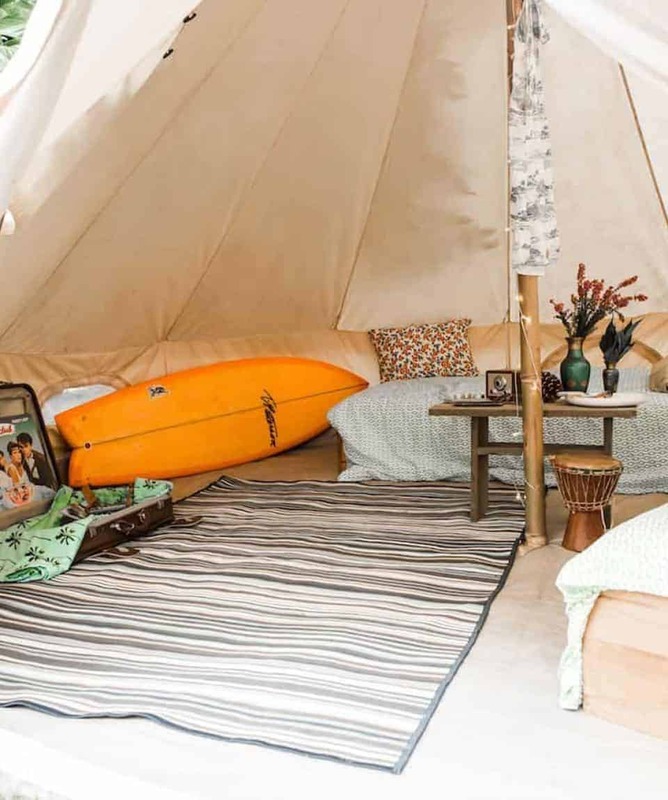 In these Tipi-like tents, you’ll share with a maximum of 2 other surfers or friends. With loads of space & a great ambience, you’ll be living the surfer lifestyle. When it’s time to get some well-earned sleep, you’re all set with the latest memory foam mattresses, which are super comfy, high density & allergy free. We know you’ll be getting a great nights sleep on these beauties, waking up ready for another great day in the sun & surf. 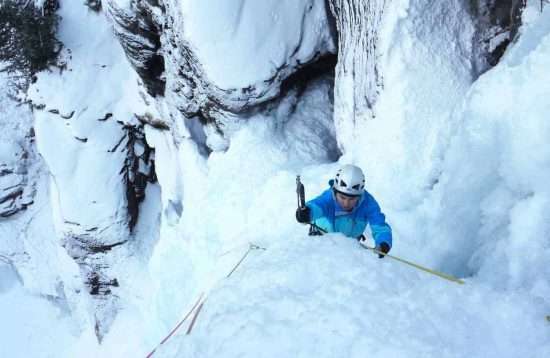 Just bring your sleeping bag & pillow or other bedding & you’re all set. 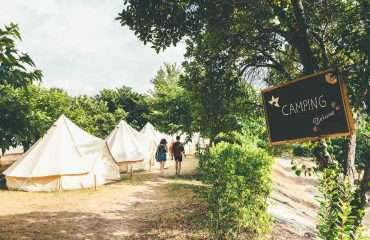 Want to bring your partner or friends with you? Then why not have a tent to yourselves? 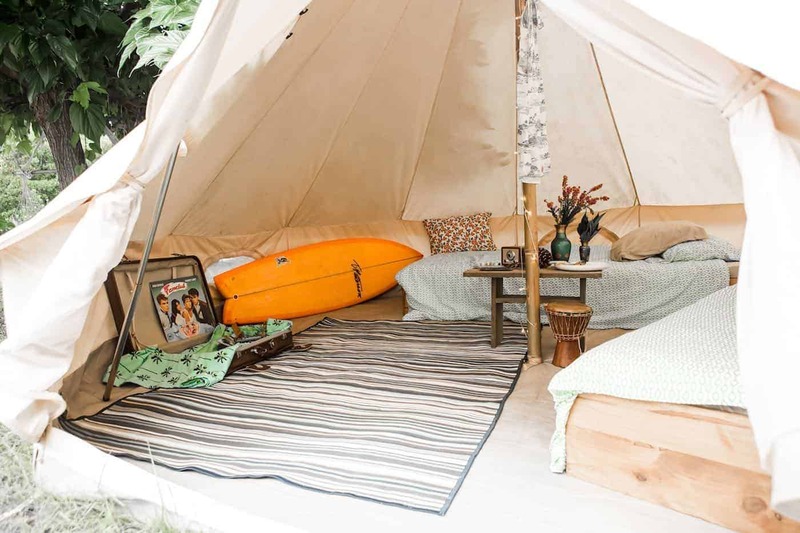 We’ll set you up in one of our Private Tents for just 35€ (£31) pp/week (high season: 50€ (£44) pp/week) & you’ll have the Tipi all to yourselves. 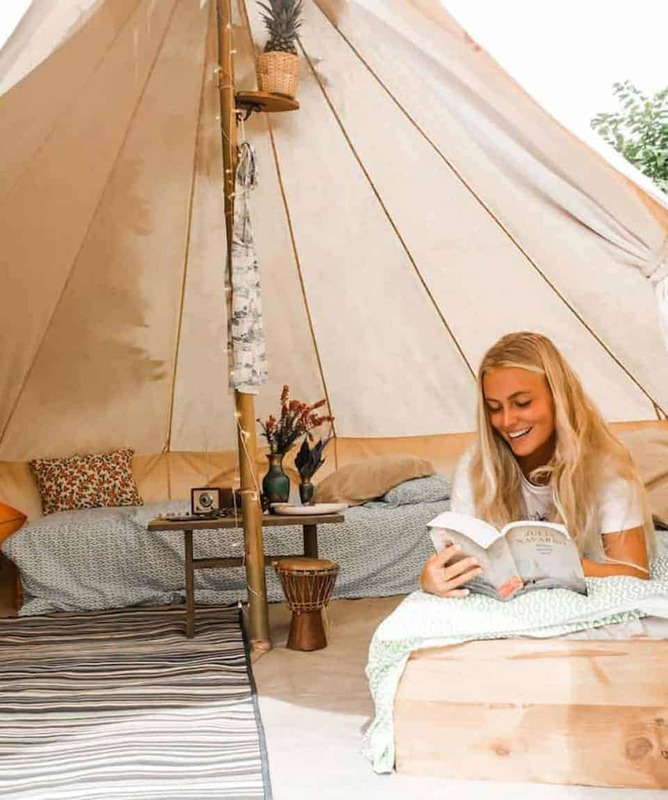 The private tents are the same large 8 person tipis & come with the same high-quality mattresses, set up as two singles or a double bed, the perfect surf escape & your own little escape. Surfing should be fun, & that’s how we’ll be teaching you. 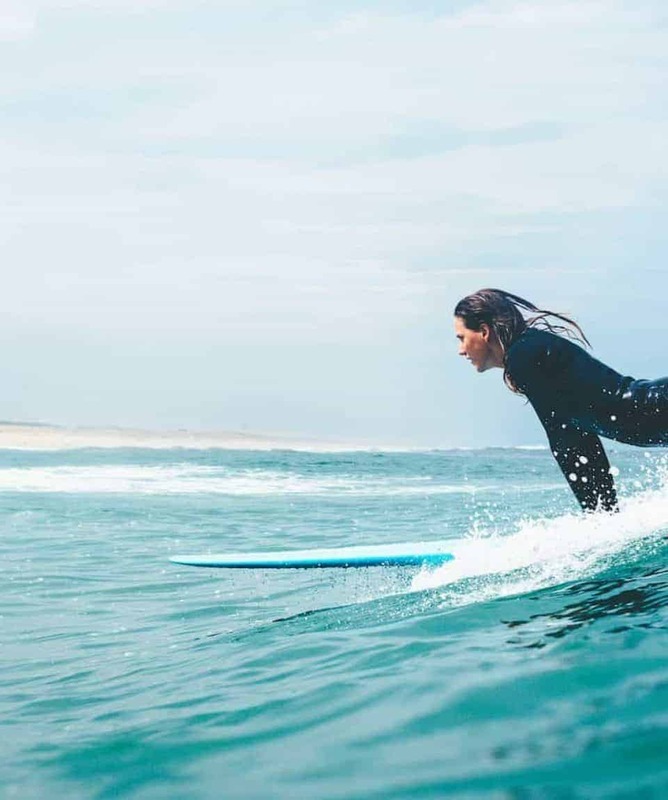 Our qualified & professional surf instructors will aim to get you comfortable & having fun while getting you catching waves & getting the most from your time in the water. They won’t just be watching you from the beach, they’ll be right there next to you & working with you every step of the way. You’ll be surfing the great waves of Moilets-Plage, right in front of the surf camp, with 12 full hours of surf lessons (included in the most popular surf camp package). 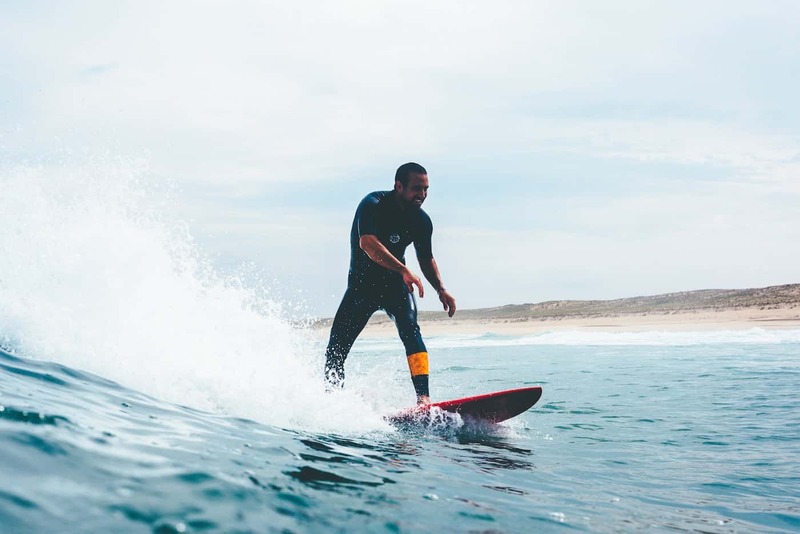 As well as lessons on surfing, we’ll cover water safety & help you to understand & identify the ocean currents, ensuring you’re confident & safe when you choose to go surfing alone. By keeping the surf lesson groups small (max 8 surfers to 1 or 2 instructors) you’ll get lots of personalized support. 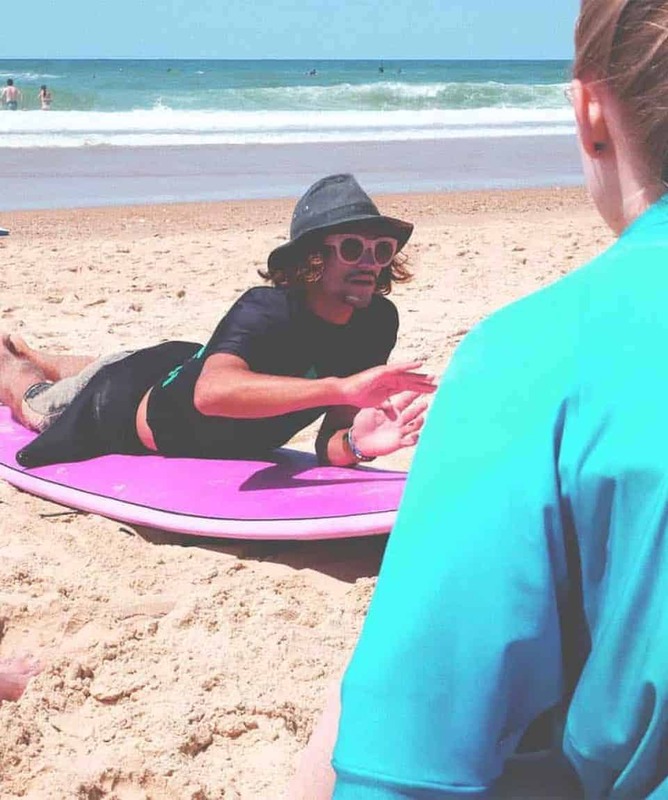 Your instructors are all experienced, professionally qualified & licensed surf instructors. They are all also qualified lifeguards. We’ll get you set up with all of the gear you need, including surfboards, leashes & wetsuits. These are all supplied to you for free during your surf lessons & there also free for you to use outside of lessons as long as we have availability. How About Surfing Uncrowded Waves During Our Sunset Surf Sessions? Of course, surfing is addictive & once you start, you won’t want to come back into the beach. No worries. 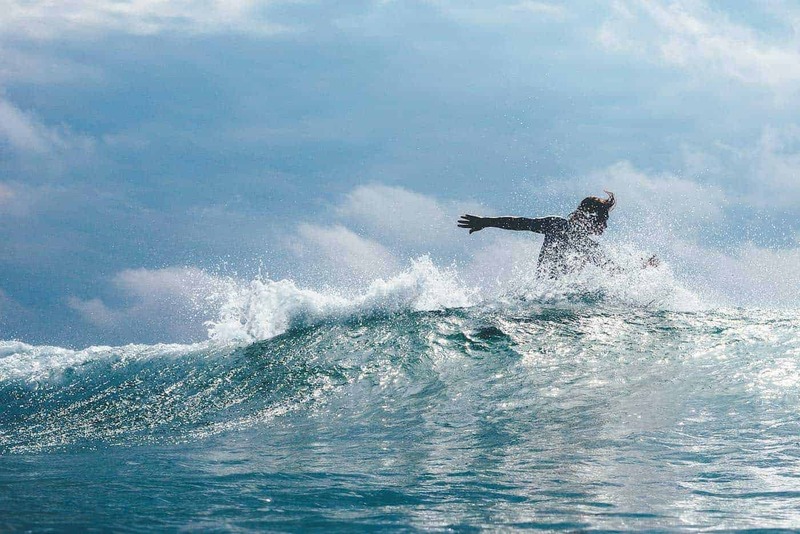 If you go with our Surf & Relax UPGRADE you’ll have an extra 4 hours of surf lessons. 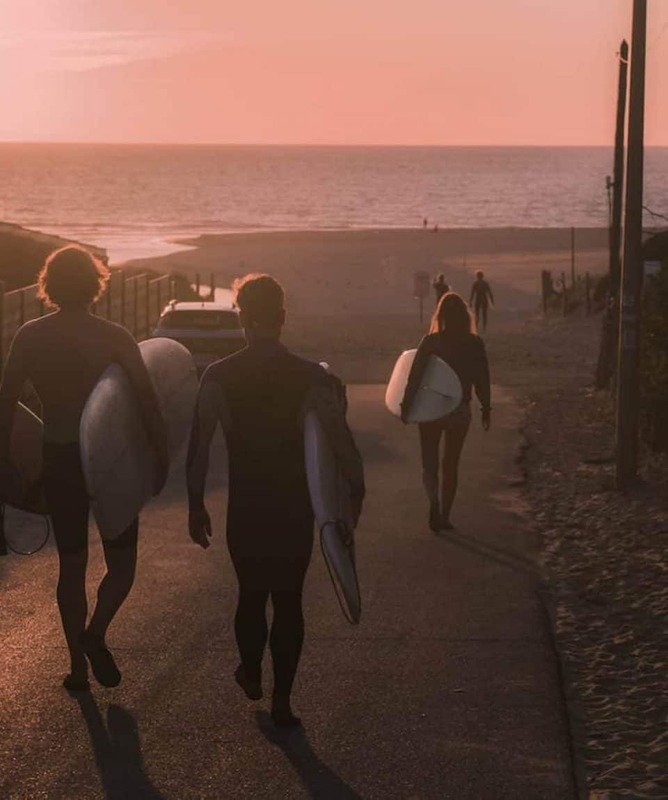 So, get in the water early for a morning session & get back out there for unforgettable sunset sessions with your surf instructor. With this upgrade, you get the chance to refine your surfing with more personalized instruction. You also get FREE surf photography with the upgrade, so you can show the world your progress & keep the memories of your surf sessions forever. We’ve Got Some Great Entertainment Ready for You. Never boring! We’ve got some great things lined up for you to keep you entertained during your surf camp holiday. We’ll adjust the schedule to suit the weather as well as the mood (or depending on how you feel after yesterday’s night out). 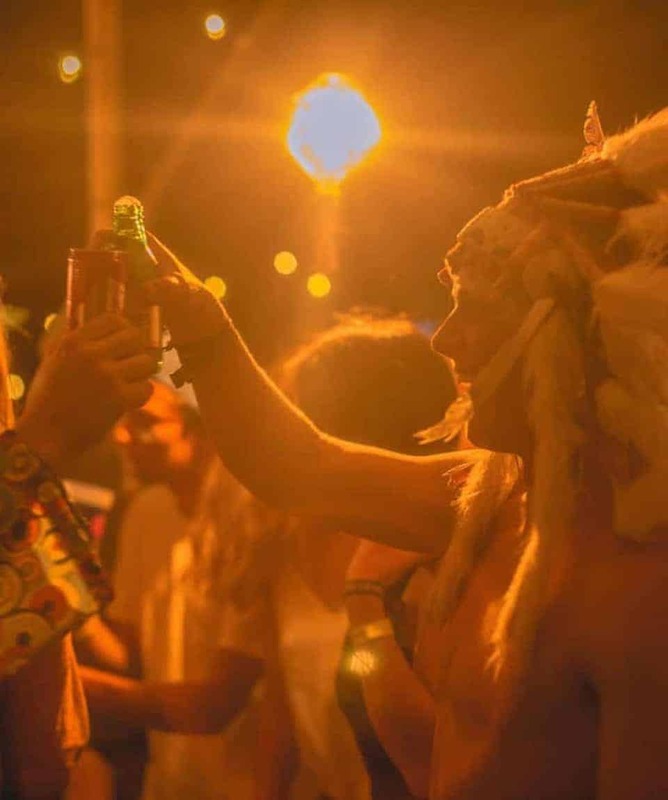 We’re going all-out to make this year’s surf camp better than ever. The camp is your chilled-out playground & oasis in the forest. 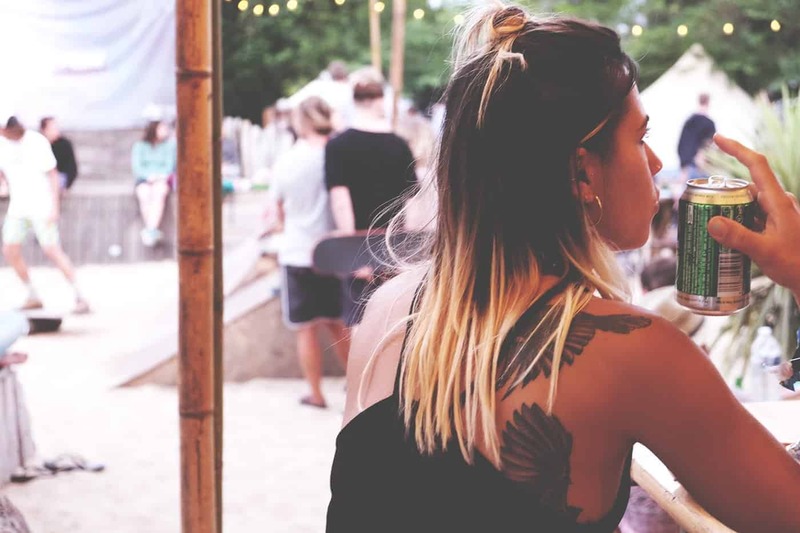 As well as the cool & stylish bell tents, there’s plenty of shaded areas to dine, a skate ramp, Tiki Bar, outdoor cinema arena, lot’s of wonderful chill out areas with hammocks, sun lounges. 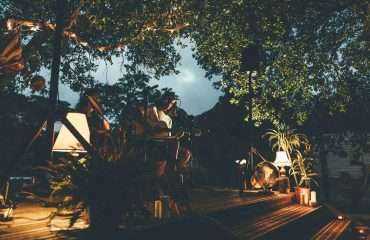 In the evenings, our coloured lights will give the surf camp a wonderful glow. 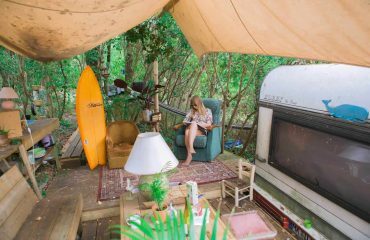 You’ve also got tents for the surf gear & a surf theory shack. Oh, & table tennis table, skateboards, longboards, balance trainers & everything else that we know will help you have an amazing surf camp holiday. 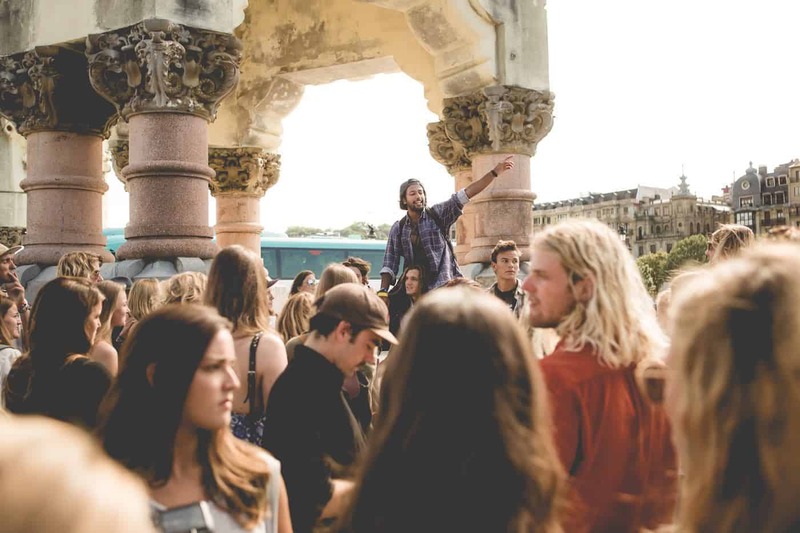 As well as the great folks you’ll get to know in the surf camp, we also want to help you enjoy the local surf culture & be able to meet & mix with other stoked surfers in the area. 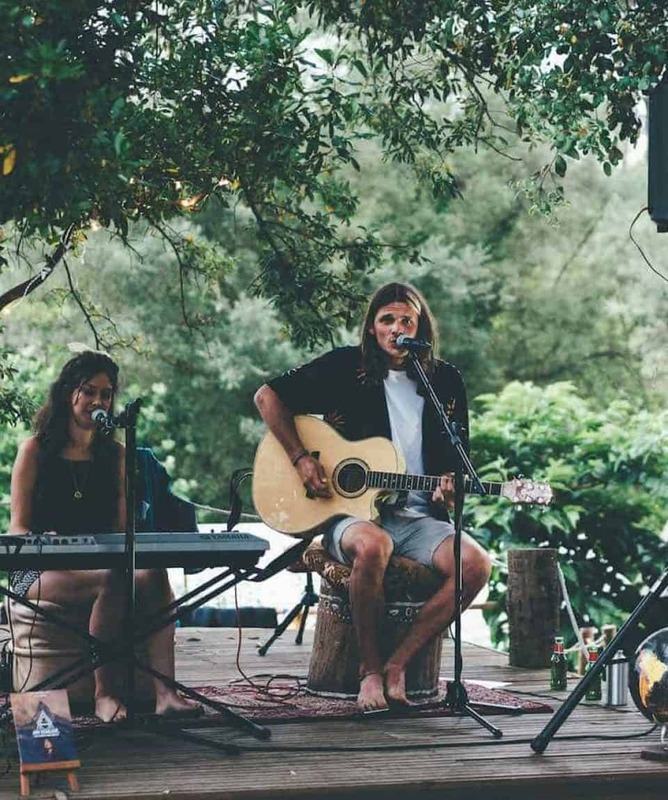 Here are just a few of the amazing things you could expect while staying with us; Live music & Open-Mic nights, Fancy Dress Flunky Ball Tournaments, Pub Quizzes, Very French Wine & Cheese Night & an under the stars Outdoor Surf Movie Night. 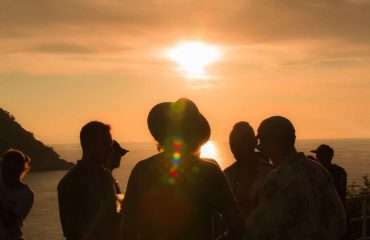 We’ll also help you witness amazing sunsets with drinks & music, right on the beach. Priceless. Oh, of course, we’re going to take you out on the town in Moilets too! Your Very Important Surf Camp Cuisine. You’ve got to start the day right. 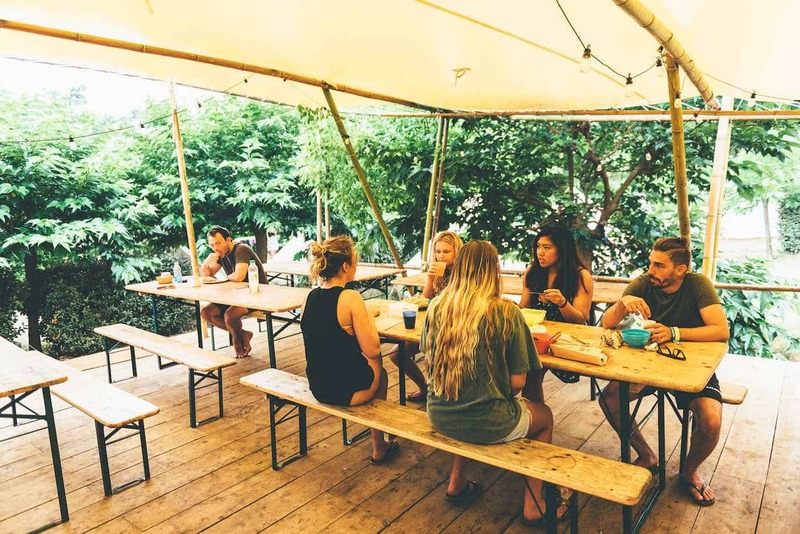 That’s no problem at the Moilets Surf Camp, you’ll have a full buffet including a selection of teas, coffee, juices, milk, cereals, honey, jam, fresh & crispy traditional French baguettes, a large selection of cheeses, hams, salamis & other spreads. You also have fresh fruit on a daily basis, tasty croissants, sweet & savoury crêpes & many more delicious baked treats. Whatever you don’t get to try in the morning, feel free to take it with you for the perfect picnic lunch during your day surfing. 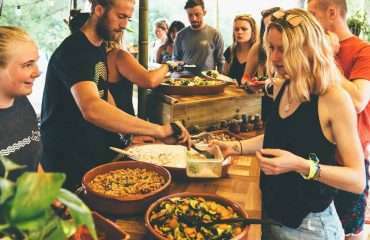 Big hearty dinners with delicious desserts are served 5 nights during your surf camp week. Of course, this is a perfect setting for a BBQ, so once a week, that’s what we do. With our surf tarp set up, music playing & good vibes all around, we’ll fire-up the coals & prepare a feast. 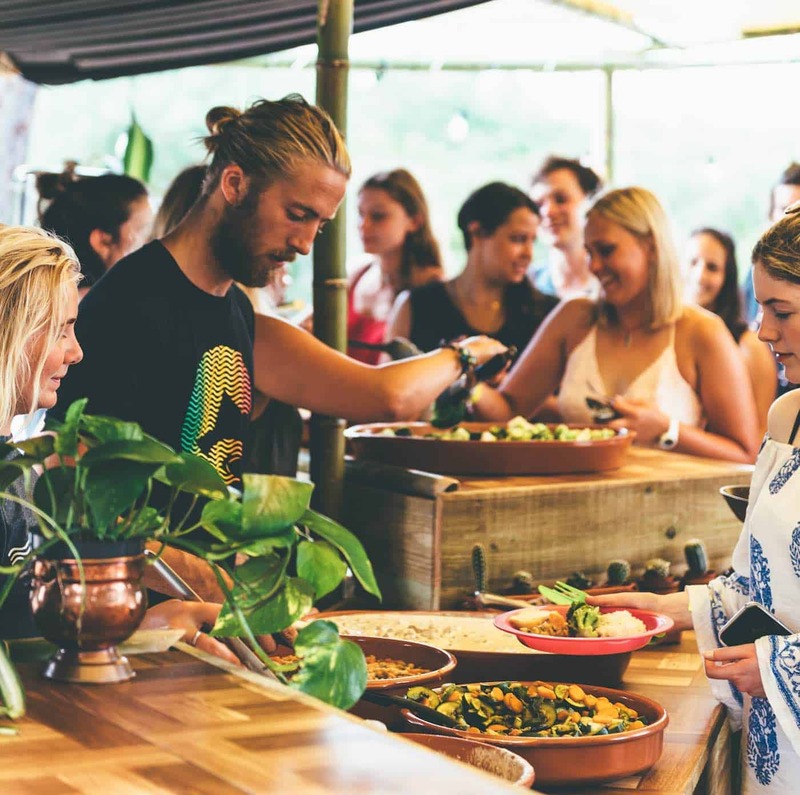 Of course, our chef needs a night off, & that’s when we recommend you join us for a ‘Tapas, Sangria & Party Tour’ to San Sebastián, it’s a social & culinary highlight of our surf camp week. 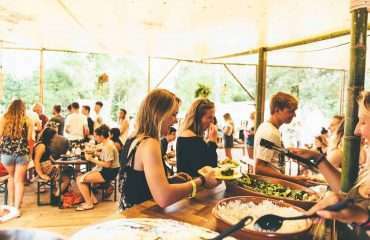 Of course, you might get the munchies during the day, no problem, just hit our little Snack Shack for snacks, ice creams, cold drinks, chocolate bars & other little treats to keep you going during your great Moilets Surf Camp days. 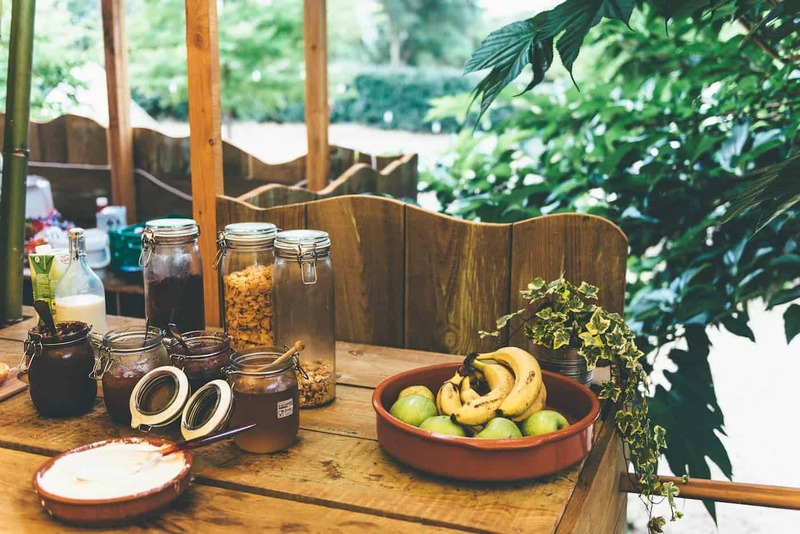 If you have any allergies or special dietary requirements, just let us know during the booking process or before arrival & we’ll look after you. Of course, we have Vegetarian & Vegan options but please let us know, so we can make sure it’s ready for you. 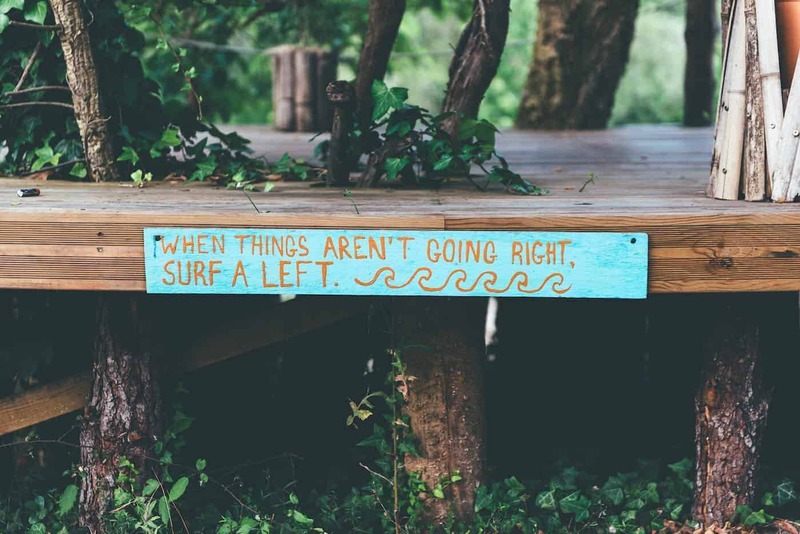 We’ve Got Great Trips Planned, So Shake off The Sand & Let’s Go. 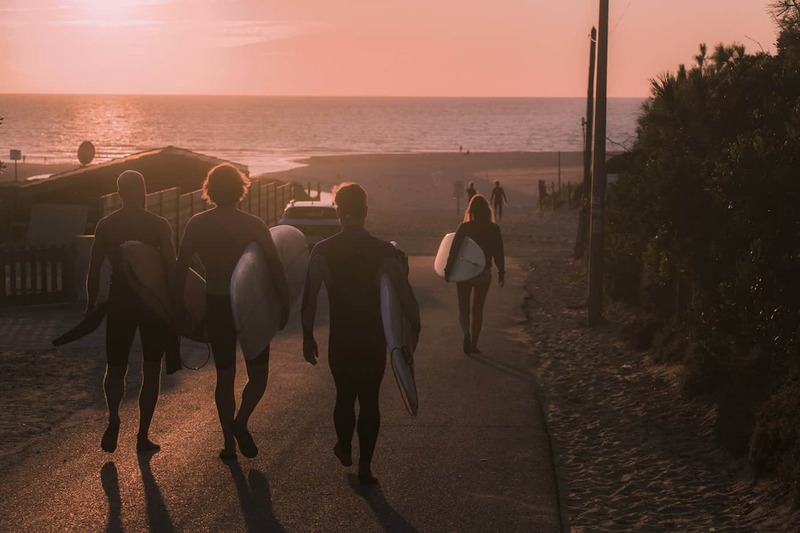 Living the laid-back surfer lifestyle is priceless, the sun drying the water off your tanned body after you’ve come out of the water after a great surf session, with the memory of your last great ride still in your mind. But at least once a week, maybe twice, we scrub up & hit the town. Just 20 kilometres south of France, along the gorgeous crystal clear coast of the Bay of Biscay, lies the vibrant city of San Sebastián. 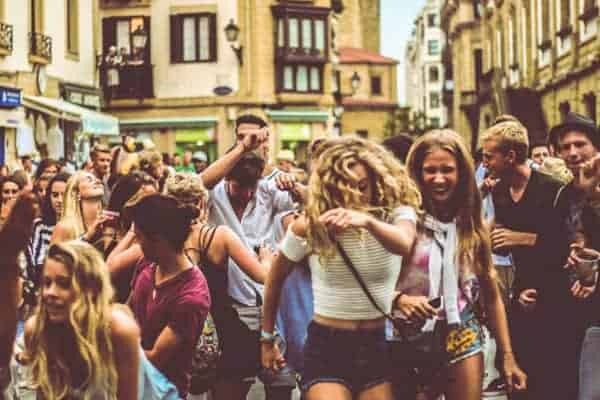 Its beautiful harbour, lively city centre & grand Spanish plazas give the city a glamorous & sophisticated atmosphere by day, while many busy tapas bars & numerous energetic nightclubs make for its flirtatious & crazy vibe at night. 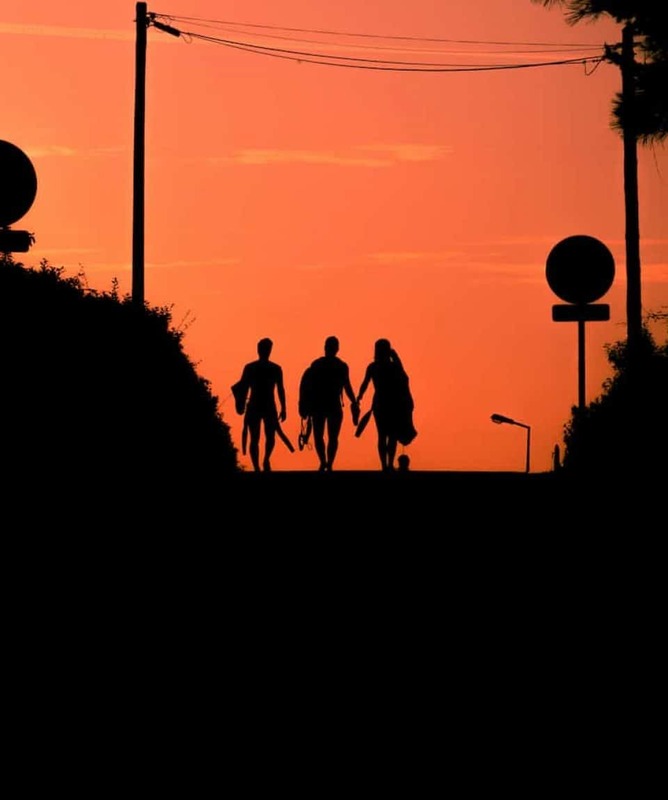 Join us on this fun & fantastic day trip away from the surf to this Spanish city we’re sure you’re going to fall in love with. Leaving our Moliets Surf Camp after your surf lessons, we start our San Sebastián day trip in the afternoon with cool sangrias, delicious tapas & a tour around the old town quarter & its bars. In San Sebastián, you’ll have plenty of free time to explore the city on your own, go shopping, explore the quaint, little streets or see the stunning cathedral before we make our way up to amazing Monte Urgull. Overlooking San Sebastián’s breath-taking bay, the top of this hill makes for the ultimate starting point for the perfect night out! 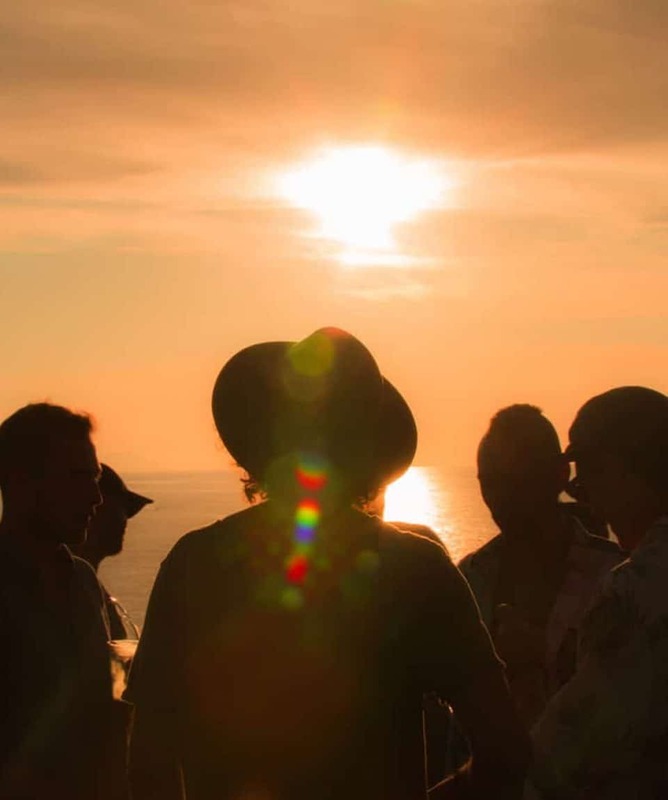 With a drink in your hand & a big smile on your face, watch the incredible sunset while getting ready to hit the bars, nightclubs & to party all night! 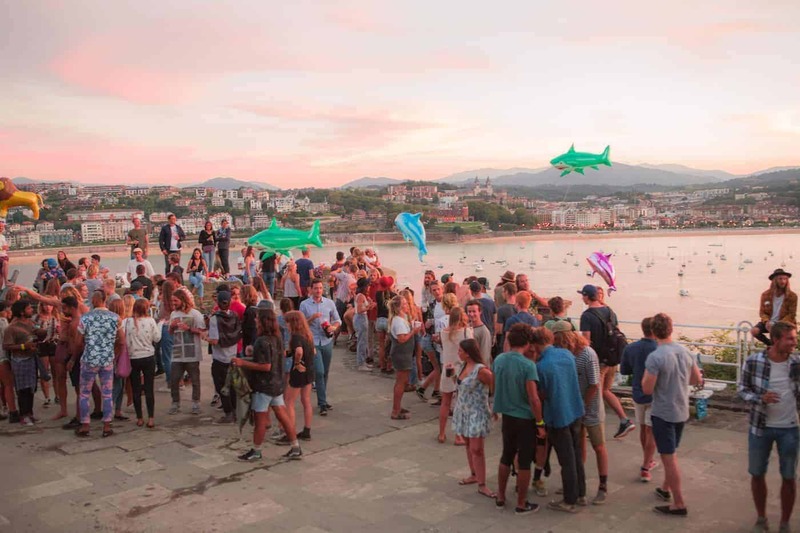 In other words, it’s a perfect match: San Sebastián’s Spanish flair & great summer vibes combined with our awesome Surf Camp atmosphere make our trip here an absolute must & an adventure not to miss. Biarritz, is, without doubt, one of the most beautiful cities in Europe. Locals often call the city “The Queen of the Basque country”. What sets Biarritz apart from the many other beautiful European coastal towns is its beauty & charm, the city is steeped in rich culture & historical relevance with particular reference to the surfing world. 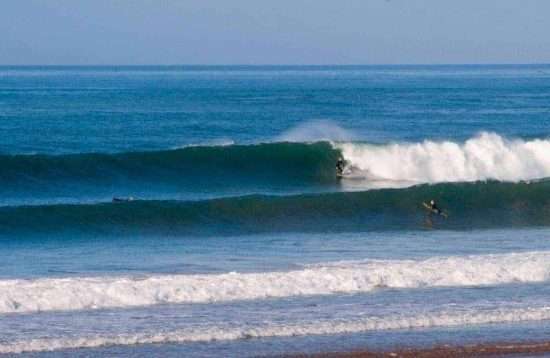 It was actually on these very beaches that the first waves in Europe were surfed when a Californian filmmaker called for his surfboard to be shipped out to France after seeing the beautiful waves on offer. 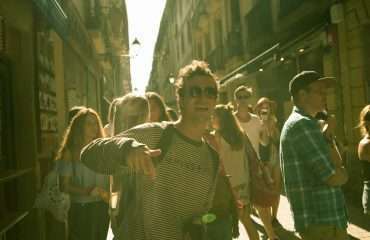 Since then the city has been an easy combination of surf & sophistication. 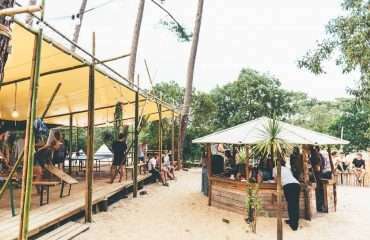 Where else can you find an up-market casino on the beach serving trendy cocktails as its patrons watch the surfers & waves almost lapping up to the roulette table? 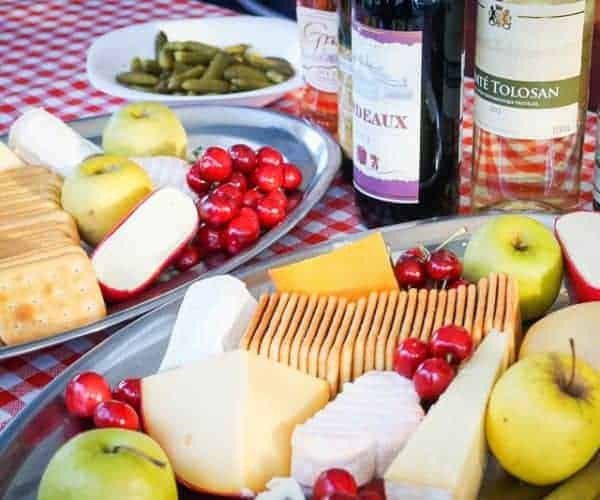 The best thing about our Biarritz Day Trip is that there is so much to see & do, so much of this chic town to sample that will cost you next to nothing. We start our tour at the famous lighthouse with panoramic views across the city & nearby beaches. 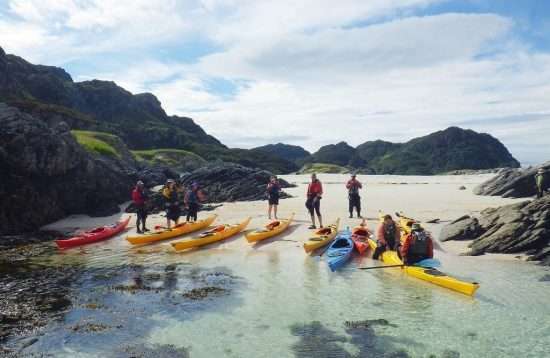 Then our walking tour will take us along the pristine coastline, across pedestrian bridges to tiny islands, weaving through art installations & statues, through stained glass churches past our favourite ice cream parlours & will certainly end at a lively watering hole, usually accompanied with live music. Magic! 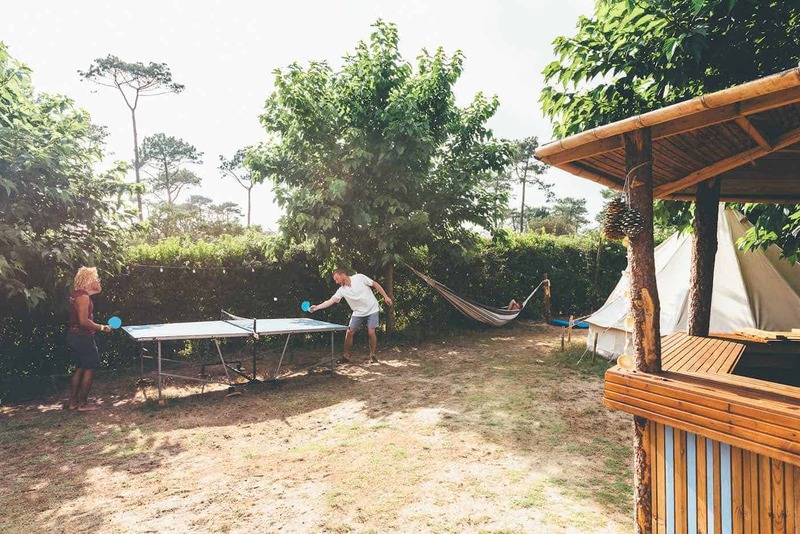 If you’re still looking for more action on your Moliets surfing holidays, our Surf Camps Moliets Team is on-site to arrange your trip to go paintballing, hit the trees in the nearby high ropes course or to go & explore the Southwest of France on horseback. There are also beach games, table tennis & volleyball tournaments, slip’n’slide & skate competitions. 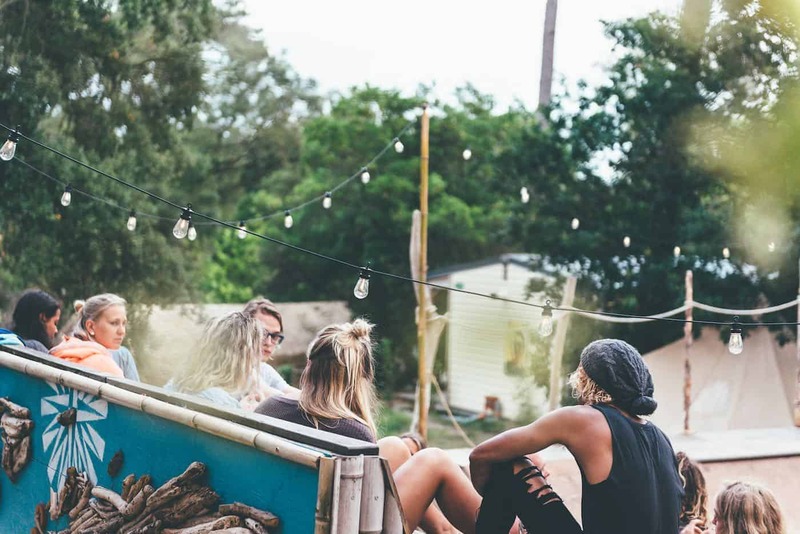 Your fun-loving Moliets Surf Team is always up for all sorts of spontaneous entertainment ideas that you & your friends can come up with. 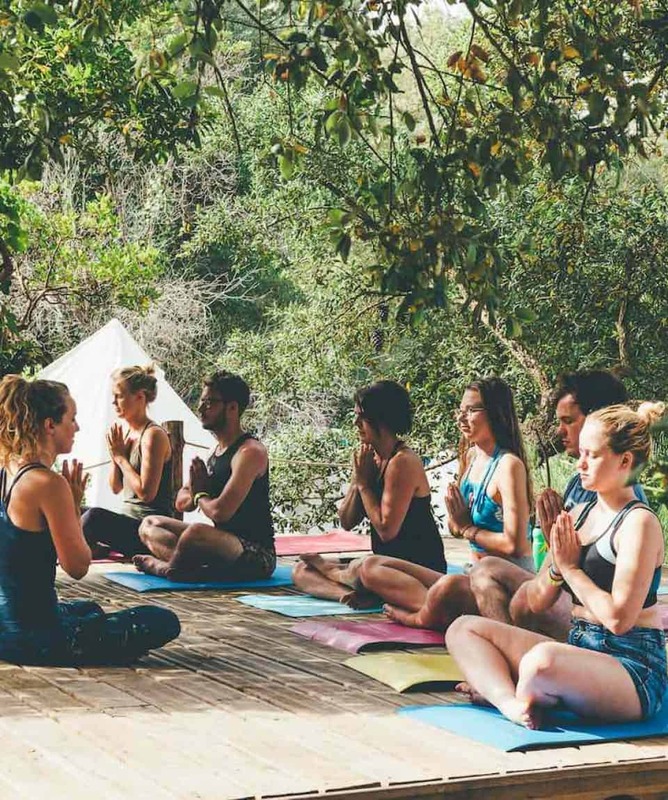 It’s no secret that surfing & yoga are a perfect match. 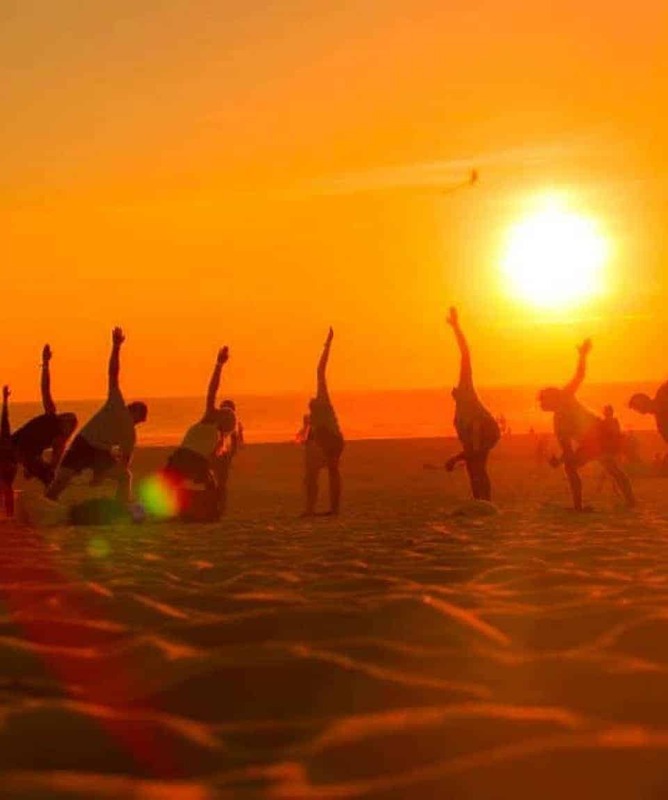 Almost all professional surfers are using yoga to improve their flexibility, core strength & surfing performance. 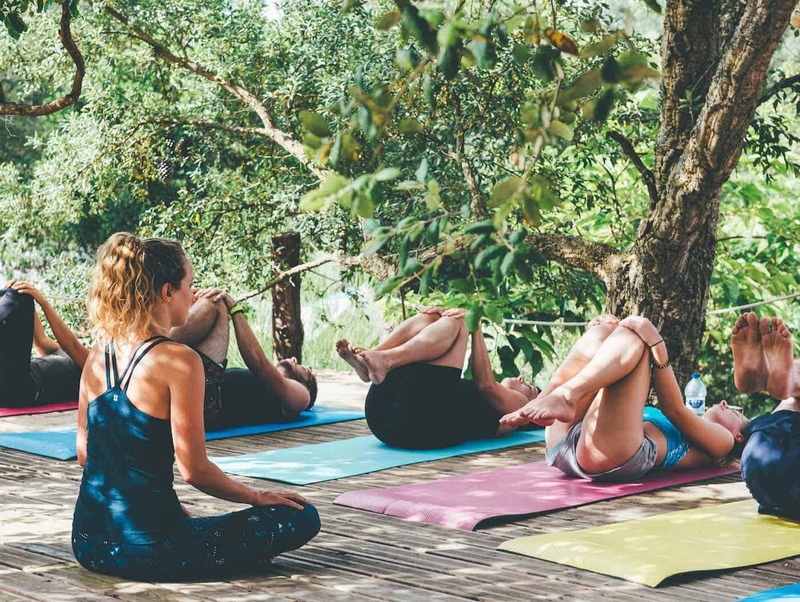 You too can enjoy the benefits, after a great day’s surfing a yoga session is the perfect way to stretch & improve your core strength & flexibility. 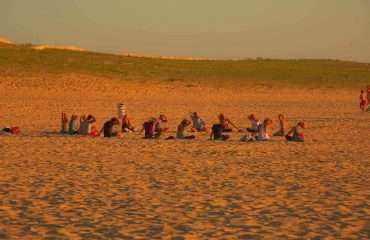 That’s why this year we’re including all of our Moilets Surf Camp packages include Surf Yoga sessions. 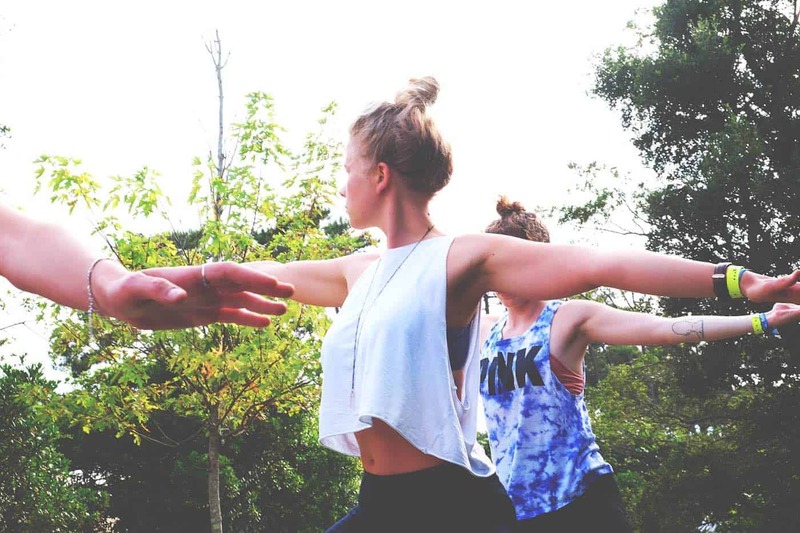 If you’re new to yoga, you’ll be guided by our friendly & fun yoga instructors. 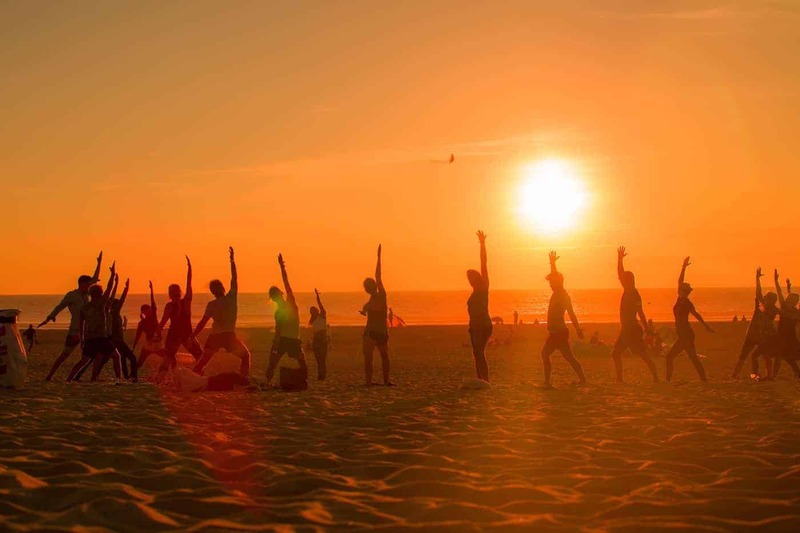 If you’re experienced in yoga, you’ll yoga sessions will focus more on how yoga can best compliment your surfing. Feel The Positive Benefits of Yoga Under The Warmth of The Suns Glow. 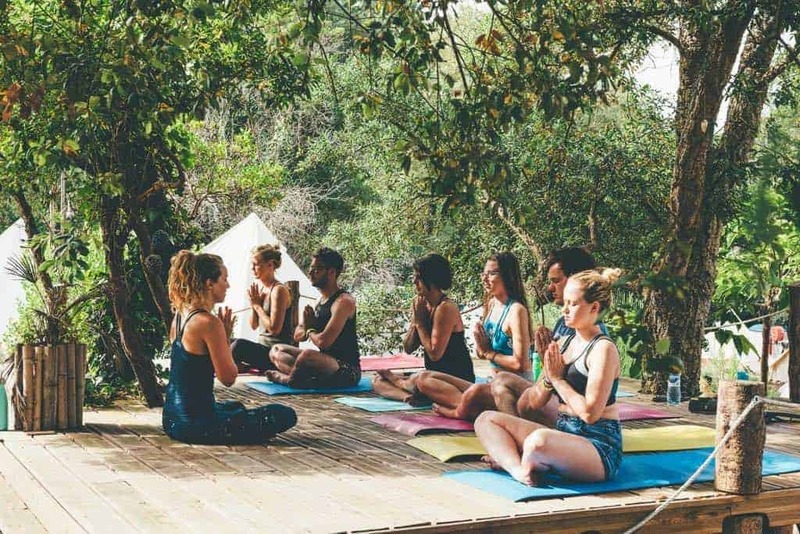 We’re here for everybody & our Moilets Surf Camp yoga instructors are friendly & fun. 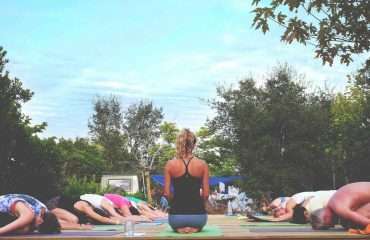 Making sure that everybody gets the most out of the experience, whether they are new to yoga or experienced yogis. If you want some extra yoga sessions, that’s no problem, just ask us at the camp & we’ll set it up for you. You’re Right Where You’ll Want To Be. 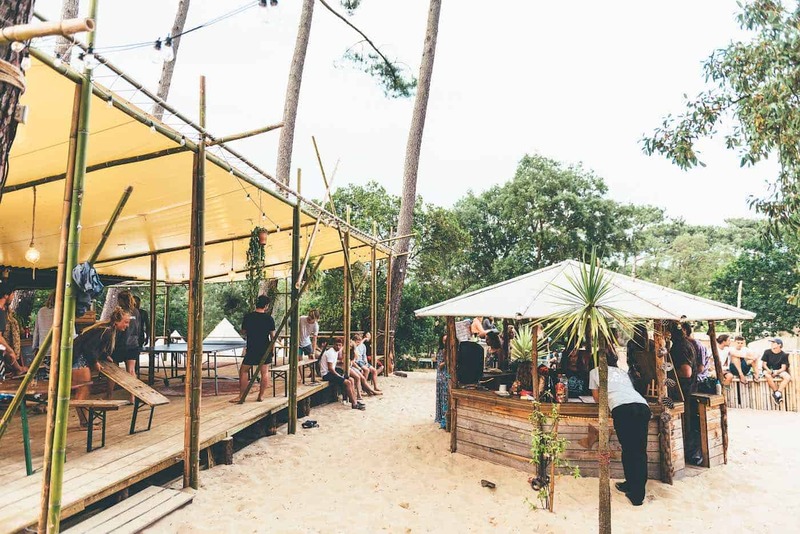 On the southwest coast of France is the vibrant town of Moilets-Plage, & that’s where you’ll find our Moilets Surf Camp. 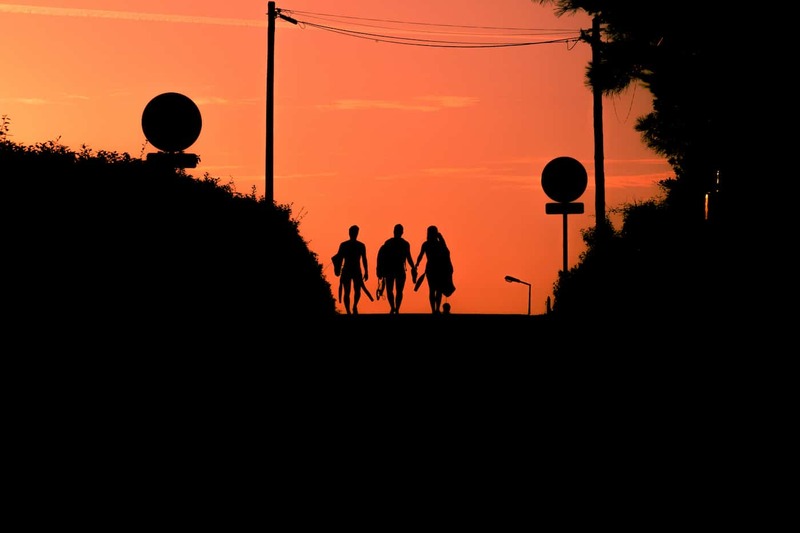 Moilets is just north of Hossegor, Europe’s surfing mecca, & close to the Basque Country & northern Spain. Moilets is famous for its great nightlife, incredible waves & amazing summer vibes. It’s the perfect place for a surf holiday. Expect the perfect combination of chilling in hammocks in the shade, out of the hot sun, lazing on the white sand beaches & gliding on perfect waves. 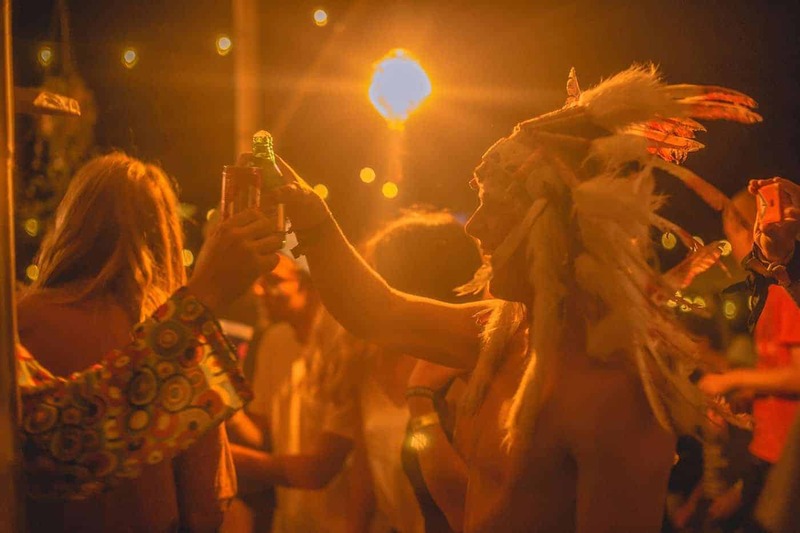 With unforgettable nights out in both Moilets & San Sebastián, you’ll have a perfect surfing holiday & the time of your life. 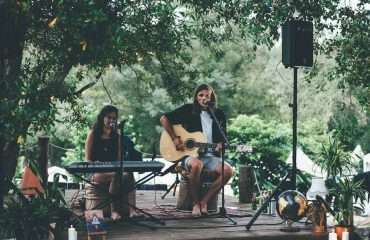 Our Moilets Surf Camp is amongst a larger campsite that hosts other surfers & surf camps, with a great atmosphere. Here you’ll find many bathrooms & showers, all with sinks & mirrors open 24 hours. Here you also have Basketball, football, volleyball & tennis courts, all FREE for you to use. 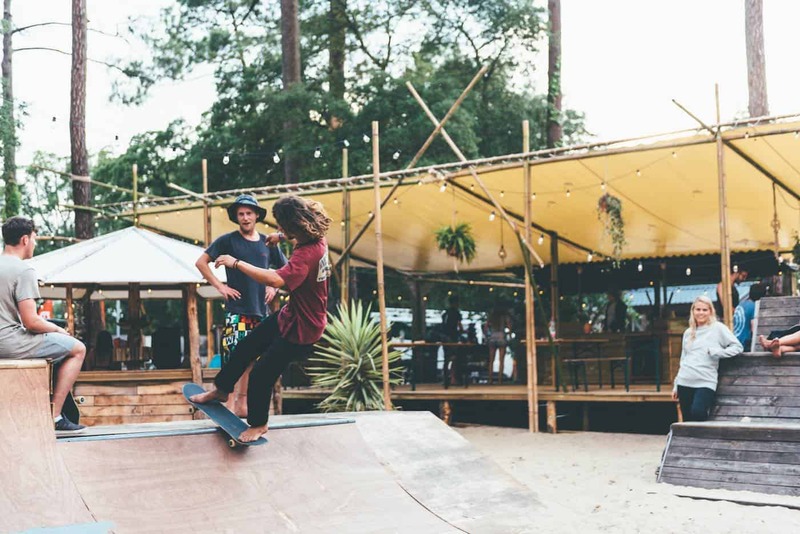 The town centre & beach of Moilets-Plage is just a quick skate away. 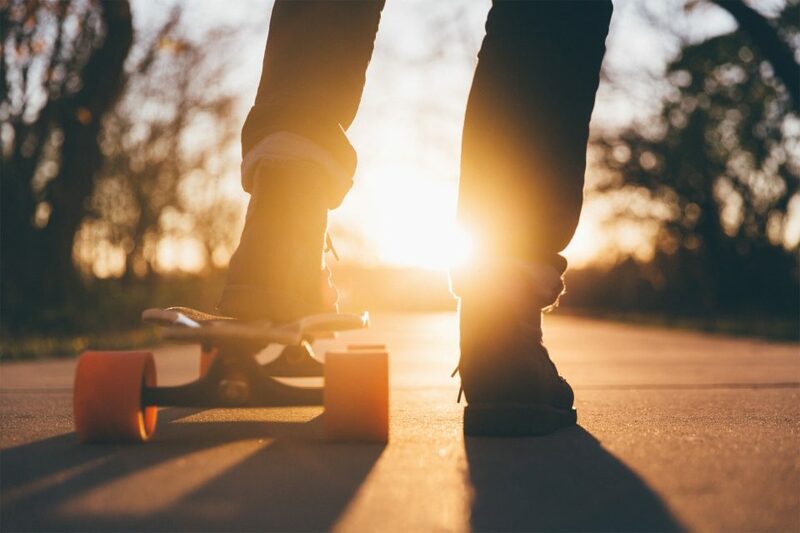 Free access to surf camp equipment, such as balance boards, skateboards, beach games, etc. 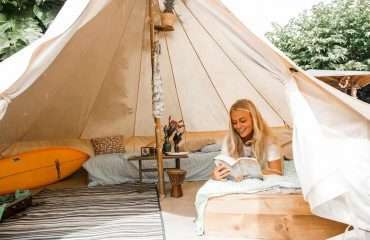 Super cool, stylish new bell tents. In these Tipi like tents, you’ll share with a maximum of 2 other surfers or friends. With loads of space & a great ambience, you’ll be living the surfer lifestyle. When it’s time to get some well earned sleep, you’re all set with the latest memory foam mattresses, which are super comfy, high density & allergy free. We know you’ll be getting a great nights sleep on these beauties, waking up ready for another great day in the sun & surf. 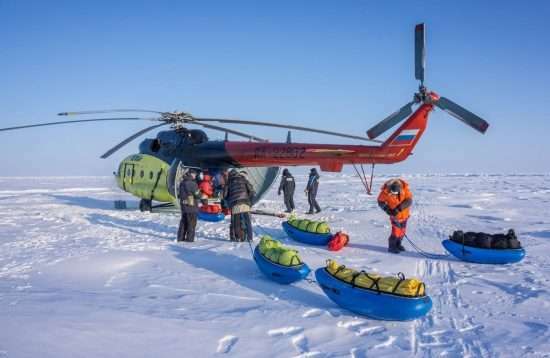 Just bring your sleeping bag & pillow or other bedding & you’re all set. 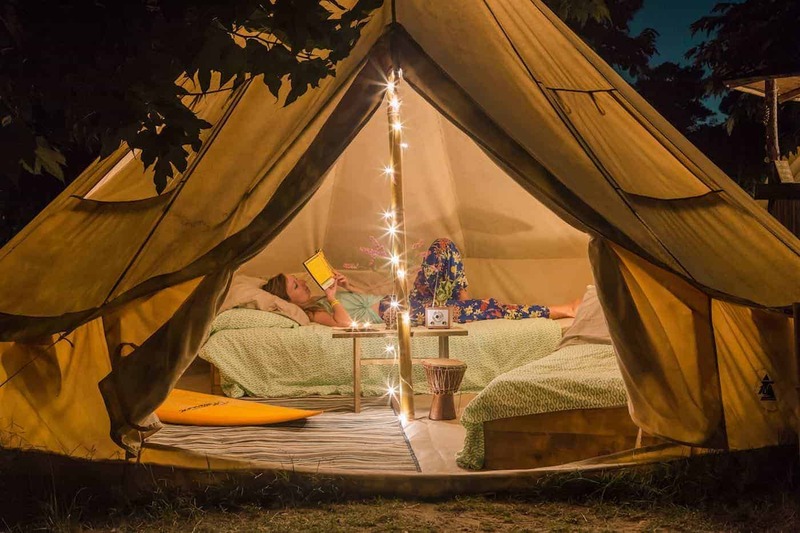 We’ll set you up in one of our Private Tents for just 35€ (£31) pp/week (high season: 50€ (£44) pp/week) & you’ll have the Tipi all to yourselves. 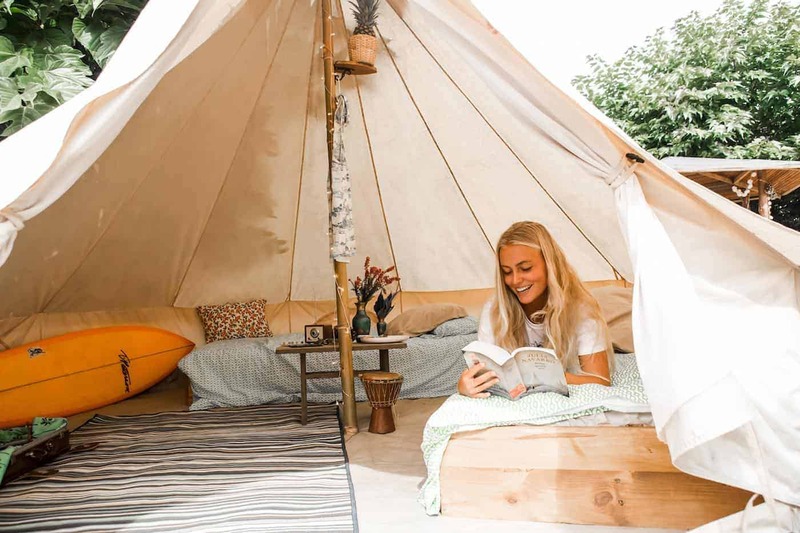 The private tents are the same large 8 person tipis & come with the same high quality mattresses, set up as two singles or a double bed, the perfect surf escape & your own little escape. You’ve got to start the day right. 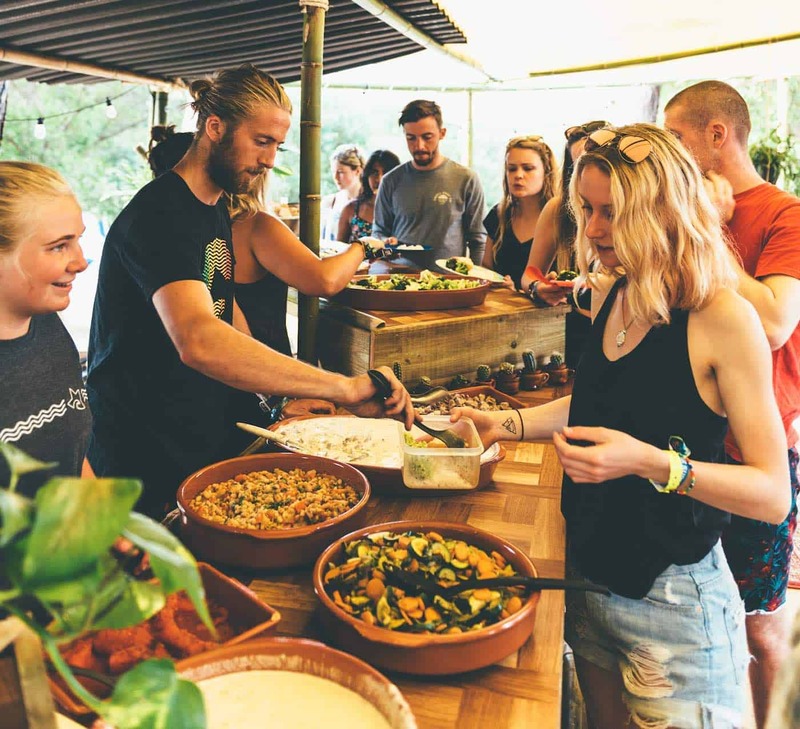 That’s no problem at the Moilets Surf Camp, you’ll have a full buffet including a selection of teas, coffee, juices, milk, cereals, honey, jam, fresh & crispy traditional French baguettes, a large selection of cheeses, hams, salamis & other spreads. You also have fresh fruit on a daily basis, tasty croissants, sweet & savoury crêpes & many more delicious baked treats. 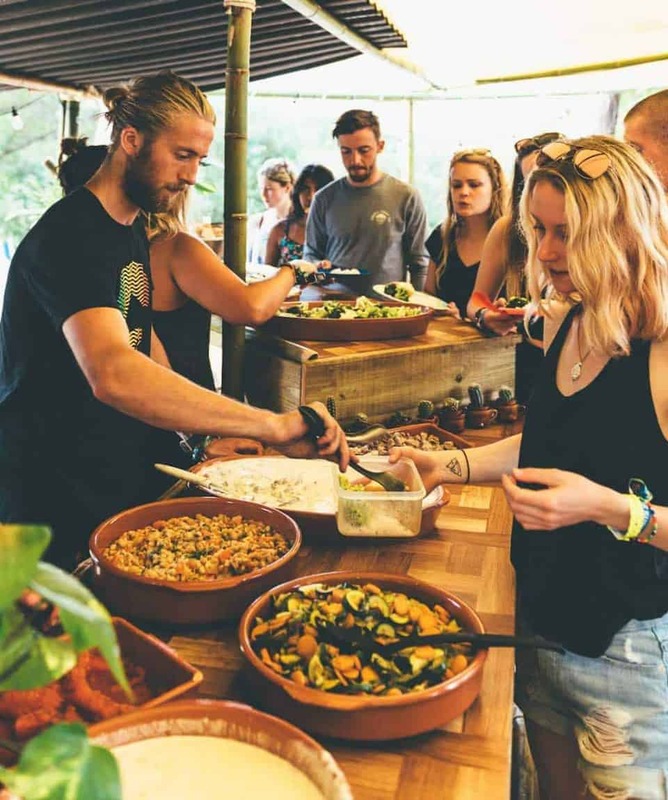 What ever you don’t get to try in the morning, feel free to take it with you for the perfect picnic lunch during your day surfing. Big hearty dinners with delicious deserts are served 5 nights during your surf camp week. Of course this is a perfect setting for a BBQ, so once a week, that’s what we do. 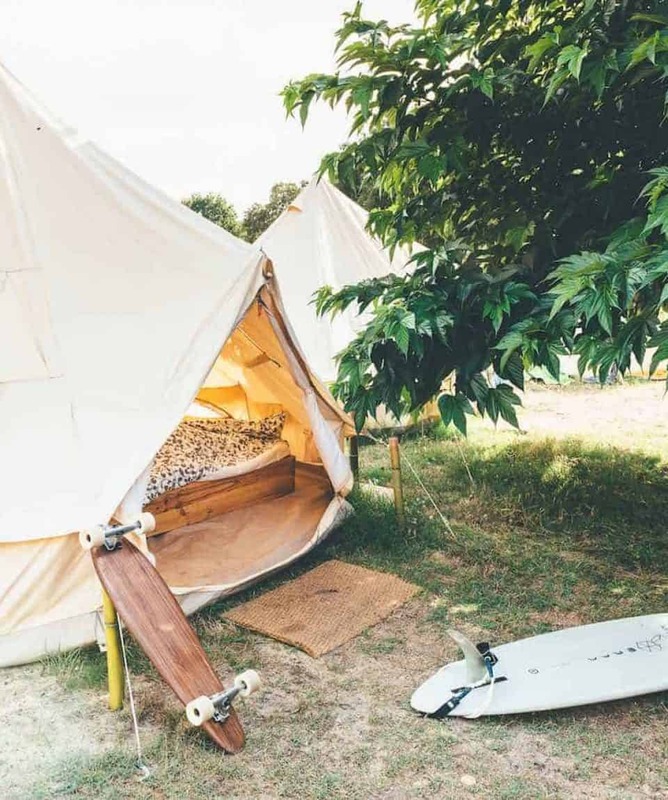 With our surf tarp set up, music playing & good vibes all around, we’ll fire-up the coals & prepare a feast. Of course our chef needs a night off, & that’s when we recommend you join us for a ‘Tapas, Sangria & Party Tour’ to San Sebastián, it’s a social & culinary highlight of our surf camp week. 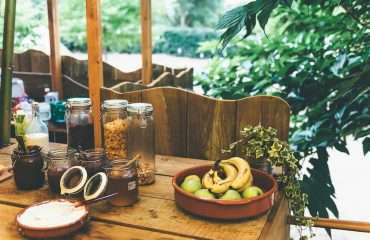 If you have any allergies or special dietary requirements, just let us know during the booking process or before arrival & we’ll look after you. Of course we have Vegetarian & Vegan options but please let us know, so we can make sure it’s ready for you. 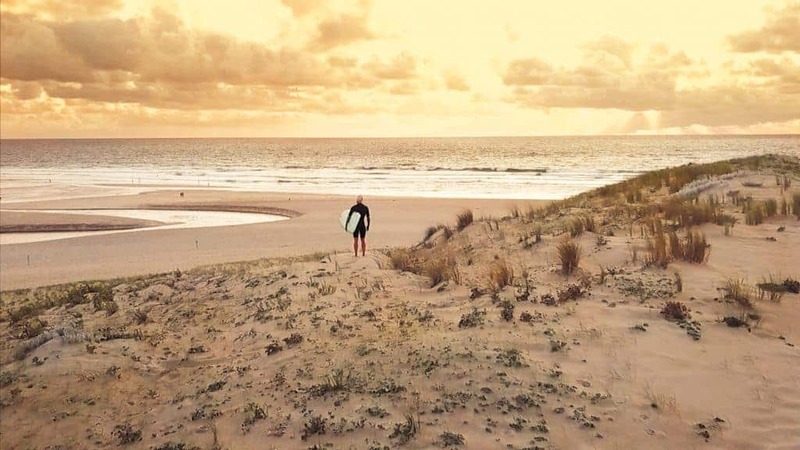 On the southwest coast of France is the vibrant town of Moilets-Plage, & that’s where you’ll find our Moilets Surf Camp. Moilets is just north of Hossegor, Europe’s surfing mecca, & close to the Basque Country & northern Spain. 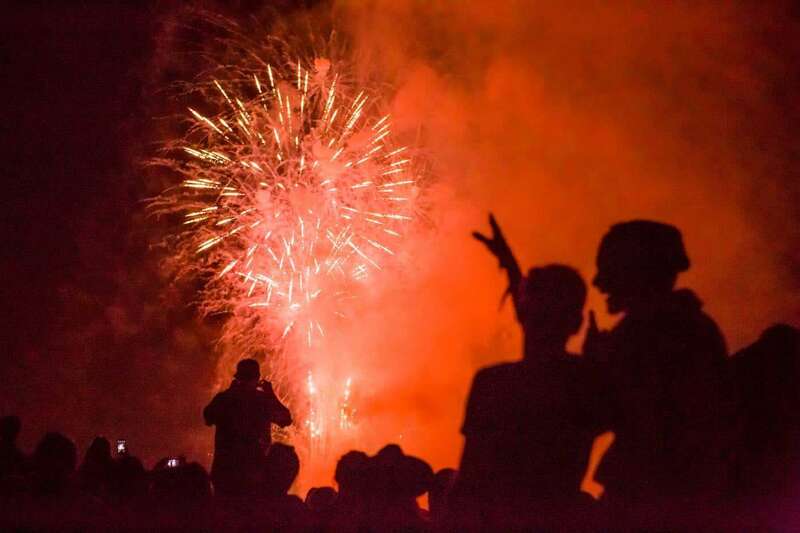 Moilets is famous for it’s great night life, incredible waves & amazing summer vibes. It’s the perfect place for a surf holiday. Expect the perfect combination of chilling in hammocks in the shade, out of the hot sun, lazing on the white sand beaches & gliding on perfect waves. With unforgettable nights out in both Moilets & San Sebastián, you’ll have a perfect surfing holiday & the time of your life. Your camera and/ or, if you book the Surf & Relax Upgrade, a USB stick for your surf holiday week’s surf camp pics. Should you forget your bedding or sleeping bag on your Moliets surf holidays, don’t worry! 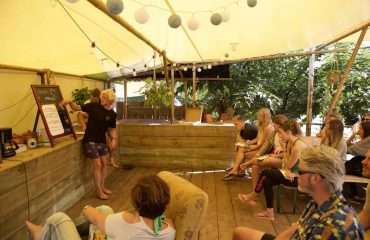 You can borrow bedding for just 25€ per surf holiday week! 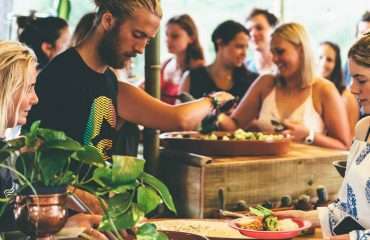 Is This Activity Level Suitable for Me?Do you cater for special dietary requirements?Can I only arrive on Saturdays in the surf camp in Moliets?I'm thinking about travelling on my own. 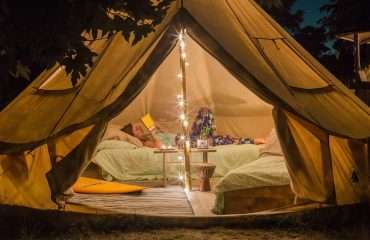 Will I have to share a tent? 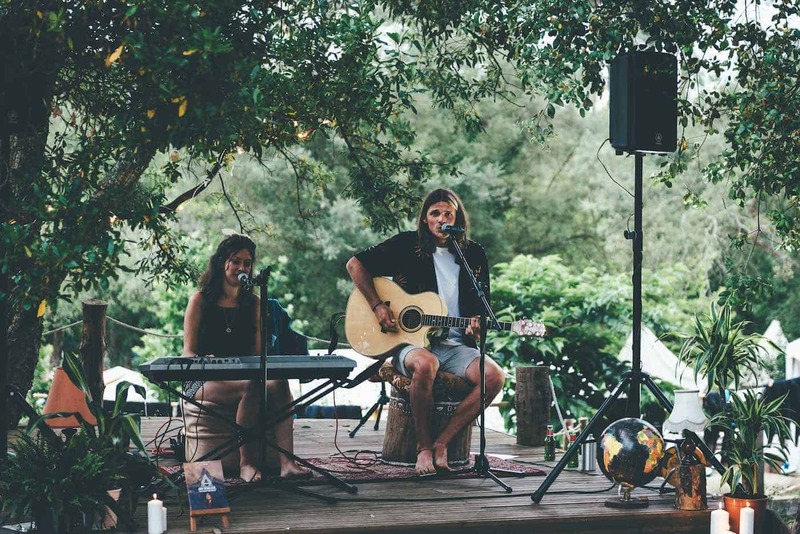 We recommend you arrive in the surf camp on a Saturday, as our surf camp week schedule runs from Saturdays to Saturdays, and we really wouldn’t want you to miss any of our amazing welcome entertainment. 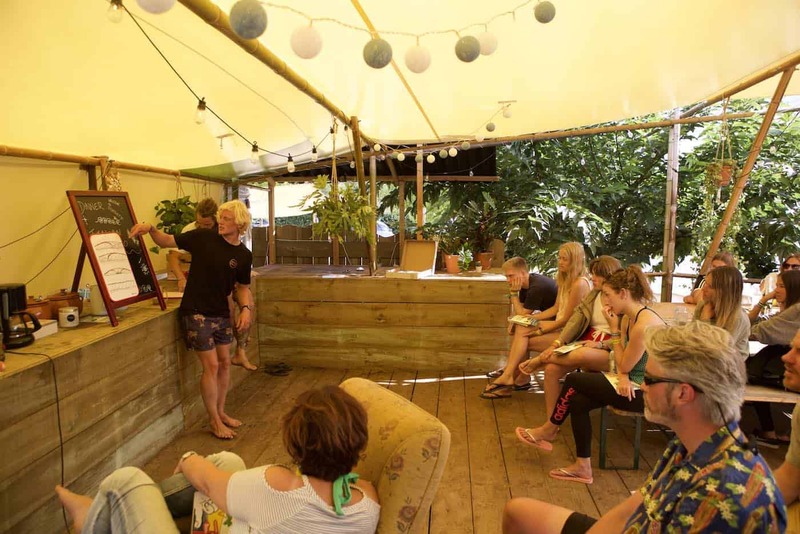 If you cannot get to the surf camp on Saturday, we recommend you arrive on Sunday morning at the latest, so you don’t miss your very first surf lesson in the afternoon. 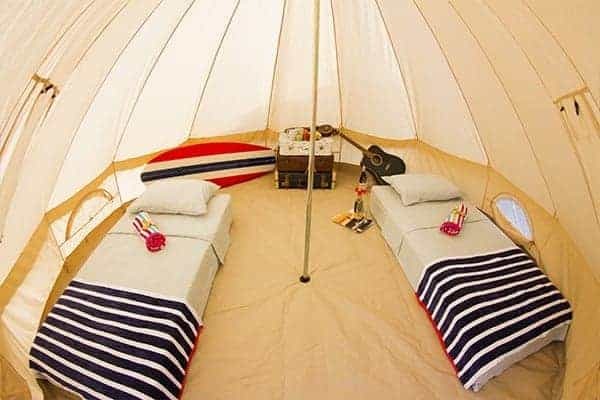 Solo travellers are encouraged to share our spacious bell tents with a max of 2 other surf holiday guests. 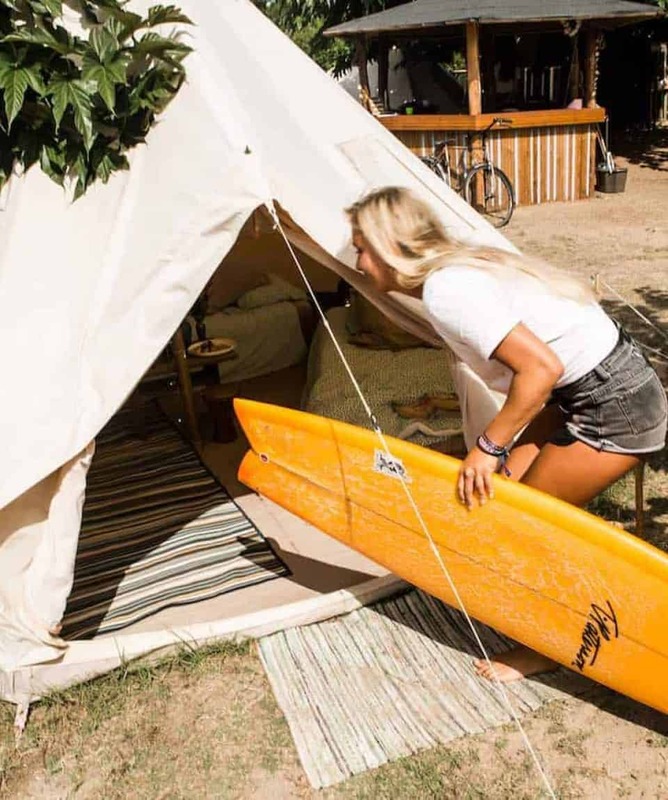 Whilst the thought of sharing a tent with people you’ve not met before may be nerve-racking, your surf roomies will be in a similar situation. 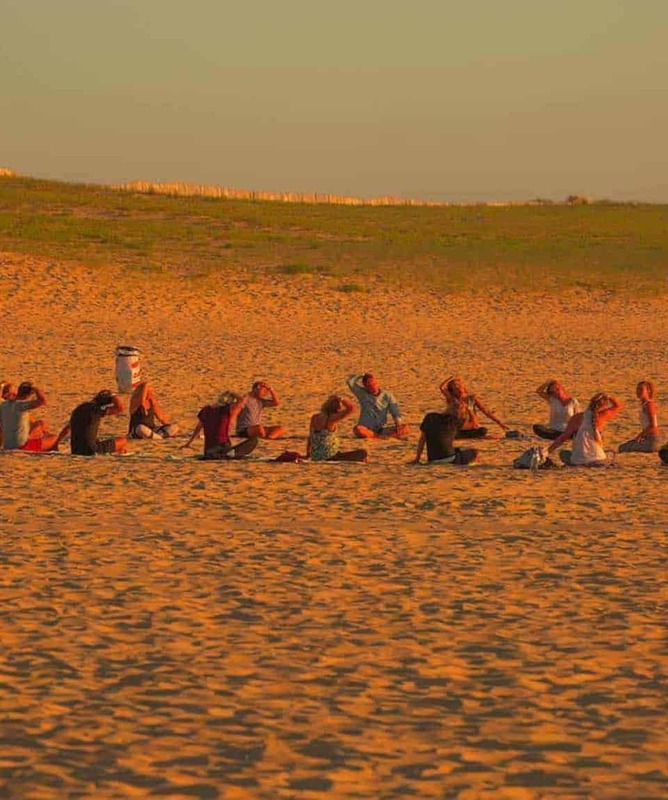 At our Surf Camps, we strive to create a friendly environment where interaction and participation are promoted. 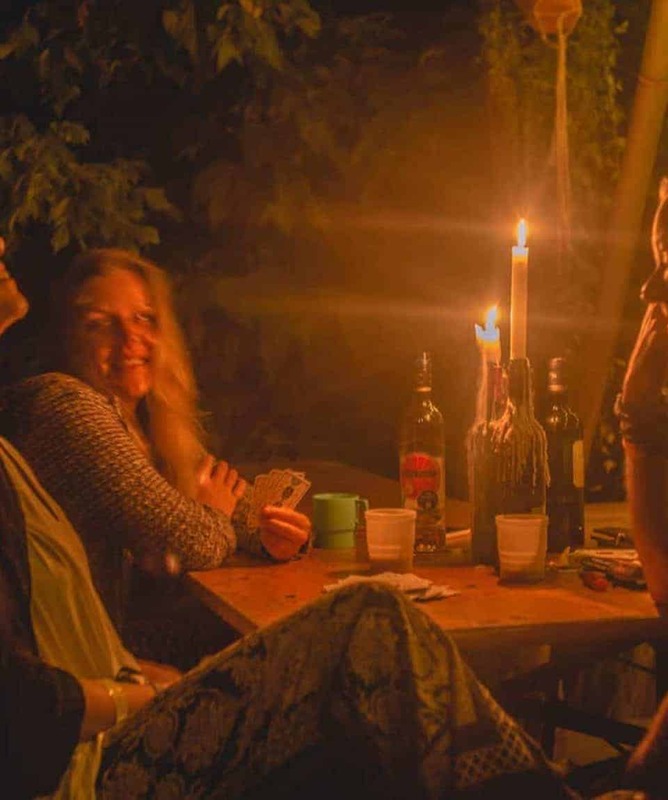 Whilst you might arrive as strangers, you will leave as friends – making great summer memories along the way. 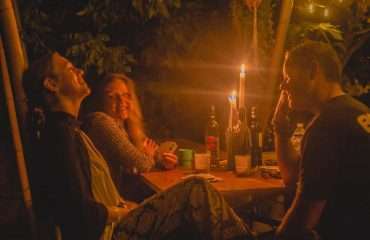 We will always plan to put female solo travellers together and the same for male solo travellers.